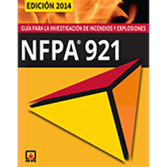 Investigate origin and cause with greater accuracy using the 2014 Spanish edition of NFPA 921. If your job involves investigating fires and explosions, then you need NFPA 921: Guide For Fire & Explosion Investigations. This document is the premier source for rendering accurate opinions on origin and cause investigations along with incident responsibility and prevention. The Spanish NFPA 921 describes in detail the scientific method to apply in fire and explosion investigations. Public and private professionals have long seen NFPA 921 as a valuable resource in the field and in training. It's also becoming increasingly relevant in U.S. federal and state courts, where the document is used to evaluate the reliability of fire investigations in both civil and criminal trials. Complying with NFPA 921 can bolster a fire investigator's opinion; not complying may result in being excluded from testifying. The 2014 edition marks the first time that NFPA 921 includes color images.